Multiply tank volume by working pressure divided by atmospheric pressure to get the amount of air a tank will hold when full. This is simplest in bar because atmospheric pressure is approximately 1 bar, so no division is necessary. The tank volume may be given in litres, kilograms of water or cubic feet. Since the density of water is 1 g/cm^3, the number of kg is equal to the number of litres. When the volume is given in cubic feet, it indicates the amount of air in the tank at working pressure (rather than atmospheric pressure), so to convert cubic feet to litres, multiply by 28.3 l/cu (1 cubic foot = 28.3 litres) and divide by the working pressure in bar. For example, a 65 cu tank with a working pressure of 230 bar, holds 8 litres, since 65 x 28.3 / 230 = 8. A 12.2 litre tank with a working pressure of 230 bar, holds 12.2 x 230 / 28.3 = 99.1 cubic feet. Very interesting and informative discussion on scuba tank markings on the diveoz forums, here. Equipment: All own gear. Rented tank. Notes: The Easter long weekend was to be packed with activity; Friday at the Byron Bay Blues festival (mainly, as far as I was concerned, to see Zappa plays Zappa), then Saturday and Sunday sightseeing and diving at Byron Bay before driving down the coast to Forster on Sunday afternoon. A double dive at Seal Rocks was booked for Monday morning before driving the rest of the way to Sydney. The blues festival was great. Relatively dry with some stonking guitar playing from Dweezil. After that, things could have gone better. Rainy miserableness took the steam out of our sightseeing, and then the same rain ran off into the sea and gave rise to terrible visibility around Julian Rocks (this is common, apparently), so the dive was canceled. Then we were just about to leave the motel in Forster and we got a call from the dive centre to say that there was some boat or fuel-related problem and they had to cancel. Balls, no diving at all. Frantic phoning and Nick from the Forster Dive Centre gave us reason to hope: a single dive around 1pm. Finally in the water. 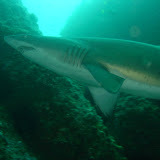 Grey nurse sharks, wobbegong sharks and fish. Slightly short. One or two members of the group were fairly heavy on air. Fairly deep, I suppose, to last long with 10.5 l tanks. Costs were: $70 for single dive, tank only. $90 for single div, tank + weights + wetsuit. $110 for single dive, all gear. Had the camera this time.